DS89C430 and DS89C450 are two ultra-high-speed 8051-compatible microcontrollers from Maxim Integrated Products. One unique feature of DS89C430/450 microcontroller is that it has a ROM loader mode which can be used to program the microcontroller itself. 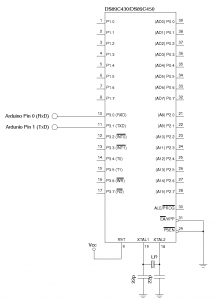 According to the user’s guide, UART0 (pin 10 and pin 11) is invoked in ROM loader mode when RST is set to High and both EA and PSEN are set to LOW simultaneously. After the ROM loader mode is enabled, serial communication can be handled between a PC’s RS-232 port and the microcontroller using a RS-232 transmitter/receiver such as DS232A. 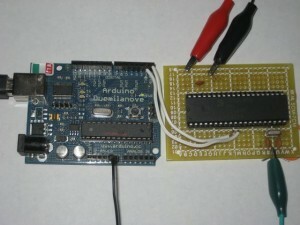 Please note that DS89C430/450’s RX pin is connected to the socket on the Arduino board marked with RX and the TX pin is connected to the socket marked with TX. 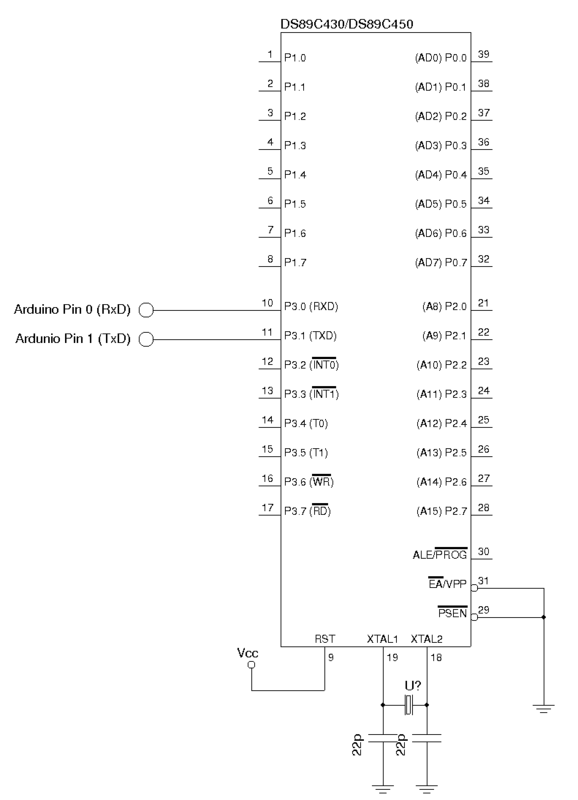 This is because Arduino’s RX socket is actually connected to the TX pin (pin 1) of FT232RL and TX socket is connected to the RX (pin 5) of FT232RL. The picture below shows how this is setup between an DS89C430 and Arduino (I used an external 5V supply here for the DS89C430 board, but you can use the 5V pin directly from the Arduino board if you want to). And the timer reload values attempted by the loader are: FF, FE, FD, FC, FB, FA, F8, F6, F5, F4, F3, F0, EC, EA, E8, E6, E0, DD, D8, D4, D0, CC, C0, BA, B0, A8, A0, 98, 80, 60, 40. In order for a given generated baud rate to work, the error between the generated baud rate and the UART’s baud rate must be less than 3%. To make the selection of crystal frequency easier, I developed a spreadsheet that can be used to determine which standard baud rate a particular crystal can operate under. You can simply plugin the crystal frequency you intend to use and the supported baud rates are automatically highlighted in green (see screenshot below). The crystal frequency I used is 21.7 Mhz which as you can see in the screenshot above supports most of the standard baud rates. I use PuTTY for the serial communication with the following parameters (note the speed must be one of the supported baud rate calculated above, it depends on the crystal you use). You can use gtkterm as well. When the microcontroller is in ROM loader mode, programs can be uploaded using the ROM loader command interface mentioned in the user guide. do you know a assembly compiler for linux as well that can be used on the 89c430? You can use sdcc for 8051 compiling under linux.